A United Launch Alliance Delta 4 Heavy rocket is lifted to the vertical position on a launch pad at NASA's Kennedy Space Center on Oct. 1, 2014. The rocket will launch NASA's new Orion spacecraft on its first test flight on Dec. 4, 2014. The towering rocket that will blast NASA's new Orion crew capsule into space on its first unmanned test flight in December has made it to the launch pad. A huge Delta 4 Heavy rocket was rolled from an assembly facility to Launch Complex 37 at Florida's Cape Canaveral Air Force Station on Tuesday night (Sept. 30), then lifted to a vertical position today (Oct. 1) for final processing and checkout activities, said representatives with United Launch Alliance (ULA), which built the rocket. The triple-core Delta 4 Heavy rocket stands 235 feet (72 meters) tall and is the largest U.S. rocket in use today . "This is a tremendous milestone and gets us one step closer to our launch later this year," Tony Taliancich, ULA's director of East Coast launch operations, said in a statement. "The team has worked extremely hard to ensure this vehicle is processed with the utmost attention to detail and focus on mission success." 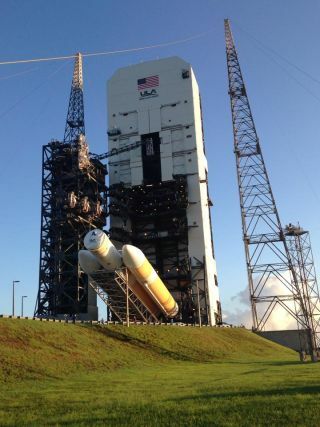 Orion will be moved to the pad and mated with the rocket next month, ULA representatives said. The unmanned Dec. 4 mission, known as Exploration Flight Test-1 (EFT-1), is designed to test out Orion's critical crew-safety systems, such as its thermal-protection gear. During the four-hour flight, the Orion capsule will fly 3,600 miles (5,800 kilometers) from Earth, then come speeding back into the planet's atmosphere at about 20,000 mph (32,190 km/h) before splashing down softly in the Pacific Ocean, NASA officials said. Orion and SLS could start carrying astronauts as soon as 2021. If all goes according to plan, the first crewed Orion flight, known as Exploration Mission 2, will send astronauts out to explore a near-Earth asteroid that has been dragged into orbit around the moon by a robotic probe. The Delta 4 Heavy consists of two stages, which together generate more than 2 million pounds of thrust. "The Delta 4 Heavy is the world’s most powerful launch vehicle flying today, and we are excited to be supporting our customer for this critical flight test to collect data and reduce overall mission risks and costs for the program," Taliancich said.